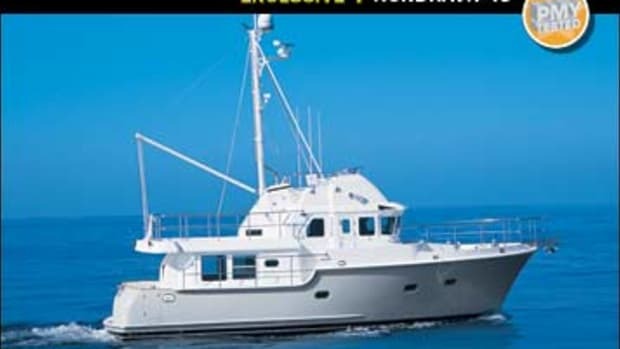 There are two ways to explain the Nordhavn 75 Expedition Yachtfisher (EYF). One is that if you want to not only go after really big fish but find them in abundance, you have to venture beyond coastal waters. 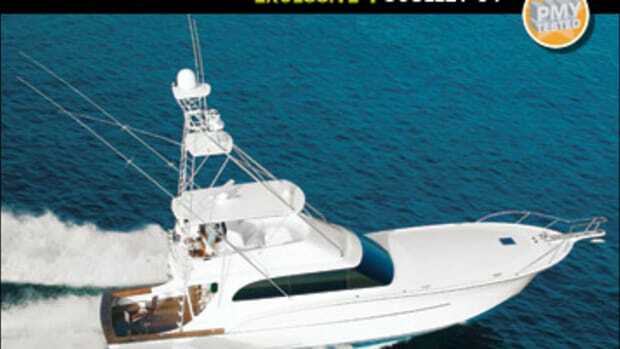 You must journey to places that never see a sportfishing boat and are visited only rarely by commercial vessels. The other is that if you’re going to do bluewater voyaging, as in being at sea for days at a time between far-flung landfalls, you may as well enjoy the sport—not to mention the gustatory benefit—of catching fresh fish along the way. Regardless of which rationale works for you, you’ll find the 75 a very serious boat. As she should be. Her sisterships not only look like they can go anywhere in the world, they actually do. Even a cursory examination of this boat will confirm that she—like them—was designed and built first to go to sea in almost any conditions and second to catch fish. That means, among other things, that she’s not just built, she’s overbuilt, a fact that extends beyond her hull structure, which by the way, is stiffened by 20 full-length stringers. 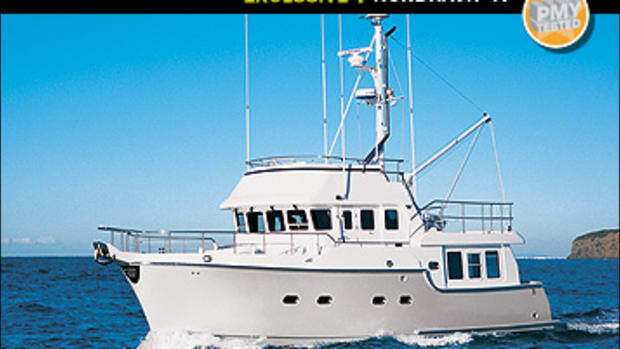 Her windows are small by conventional sportfisherman standards and of extraordinary strength to withstand the onslaught of big seas. Exterior doors are watertight, secured by multiple dogs. Every system has at least one backup and every component is quickly accessible. (I counted 29 access hatches in her sole.) Like all Nordhavns, the 75 was designed to not only cross oceans but to round capes, like Horn and Good Hope. But the 75 is also different from other Nordhavns. She’s built in a different factory, in Tsiaman on mainland China, and she’s the company’s first twin-screw boat, powered by two commercially rated 740-bhp MTU Series 60s. They accelerate her smartly, albeit not for long. 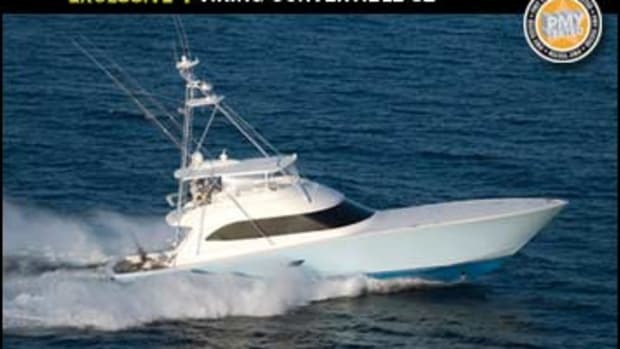 With a top speed of 13.8 mph, she’s not going to win any Bimini starts, and she doesn’t like going that speed anyway. Hers is a full-displacement hull (without the bulbous bow) with a theoretical hull speed of 10.9 mph; go any faster and she’s just pushing water and wasting fuel. 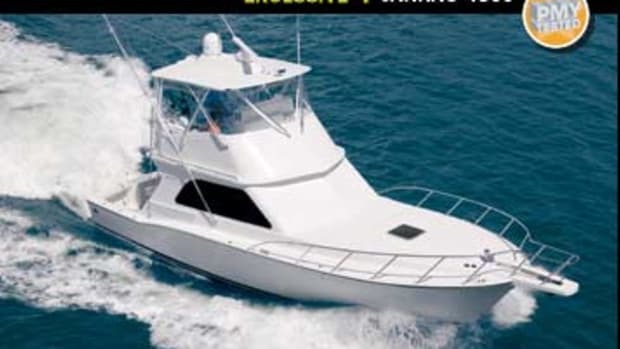 But at 1000 rpm, she’ll take you 4,200 miles with outstanding stability and seaworthiness. Bump her up to 9 mph and you can still run from Los Angeles to Honolulu (2,550 miles) with 400 miles to spare. Slow? Yes, but those are great speeds for trolling. Her range might actually have been better but for some very unsportfishermanlike characteristics. With a displacement (empty) of 185,447 pounds, she’s heavy, and intentionally so. (By comparison, Viking says its 74 Convertible weighs 135,000 with full fuel. ) On a displacement vessel, weight can be advantageous if it’s correctly deployed, improving stability and allowing a boat to punch through seas. That’s why the 75 has 13,000 pounds of ballast, including 2,000 pounds of lead ingots that are delivered loose; they’re positioned at delivery to bring her to her proper trim. And unlike a convertible’s slippery running surface, the 75’s is replete with drag-inducing appendages: fin stabilizers, prop skegs, and a full-length keel. They ensure comfort in a seaway and tracking in following seas. And in case you go aground, or just want to sit on the bottom while you check out her underbody, her running gear is fully protected by the struts and keel. There are similarities to convertibles, too, particularly in the cockpit. 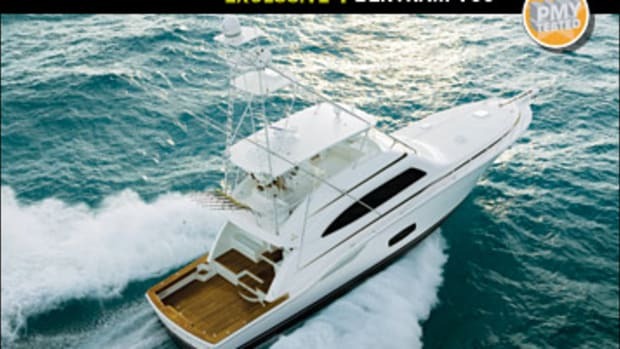 It’s big (18&apos; wide by 10&apos; long) and uncluttered, mezzanine seating is standard, it’s fully visible from the flying bridge, and you can configure its baitwells, freezers, and fishboxes about any way you want. But instead of relying on a couple of two-inch scuppers in each corner, this cockpit drains via four 8"x16" freeing ports per side, because out on Big Blue, your cockpit can fill when you don’t intend it to. To help make sure it doesn’t, aft freeboard is high. With 2&apos;10" from gunwale to water, you’d better have a long gaff or be ready to walk your fish aft to the two-foot-deep transom platform whence you can drag it through the standard 2&apos;2"-wide transom door. Things are even more challenging on the foredeck, where there’s sufficient altitude to execute a beautiful swan dive. A baitwell is available here, if you prefer casting to your quarry as they do out west, and waist-high bulwarks combined with 1&apos;10"-wide side decks will make walking your catch aft as safe as it is easy. Up here is something else you won’t see on most convertibles: serious ground tackle. 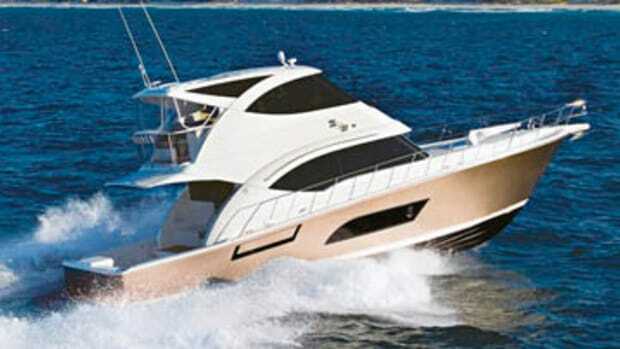 There are two Maxwell 4500 windlasses because this boat will anchor, often in deep and turbulent water. They’re part of an American Bow Thruster hydraulic system powered off both ZF marine gears that includes 38-hp bow and stern thrusters, Trac stabilizers, Kobelt power steering, a 180-gpm crash pump, and an industrial-strength raw-water anchor washdown/fire hose system. 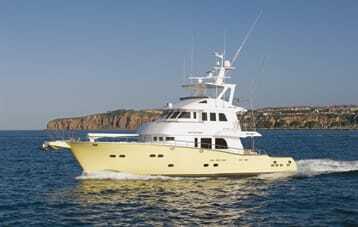 Another thing that separates the Nordhavn 75 from any sportfisherman you’ve ever been aboard is her master stateroom. Of course it’s big and luxurious—what else would you expect on a $4-plus-million yacht? But unlike those on your typical convertible, this one isn’t buried below decks and amidships. It’s a half-deck down and fully forward, where you get lots of light and views. And while the windows are small, there’s more total glass area here than on most sportfishermen, even those with those trendy hull-side windows. One final point of comparison: driving impressions. 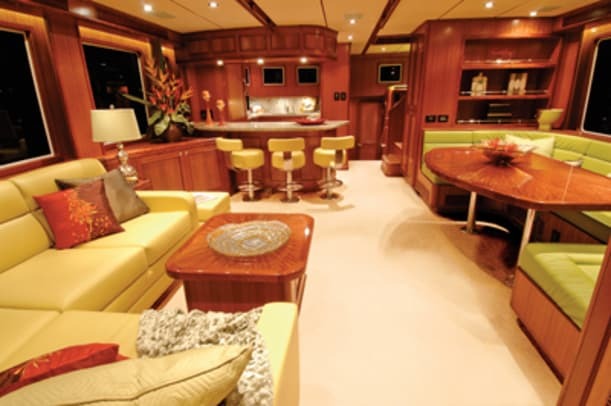 From the helm, the 75 is pure trawler. Unlike the instantaneous response you get at the wheel of a big battlewagon, everything here happens slowly and leisurely, and that includes hull movement. Even though test day saw only long, slow rollers, I could easily imagine how comfortable this boat would be in all but the worst conditions. She’s quiet, too, even at WOT. In fact, about the only thing remarkable I have to report is her steering. With big spade rudders that deflect 35 degrees in either direction, this boat can turn on a dime and give you back change. 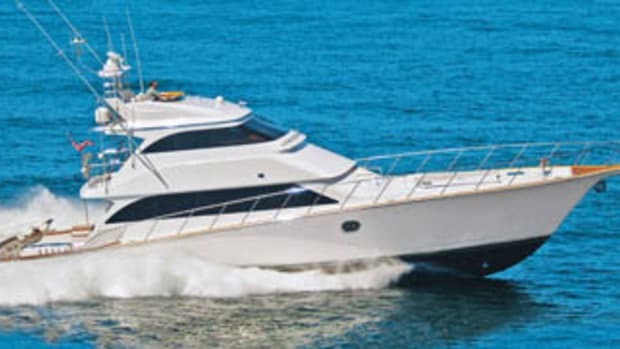 Combine that with her height and the tendency to lean outboard in hard turns that’s characteristic of deep-keel boats, and the 75 gets your attention, although minimally compared to piloting your average battlewagon. There’s no other boat like her. 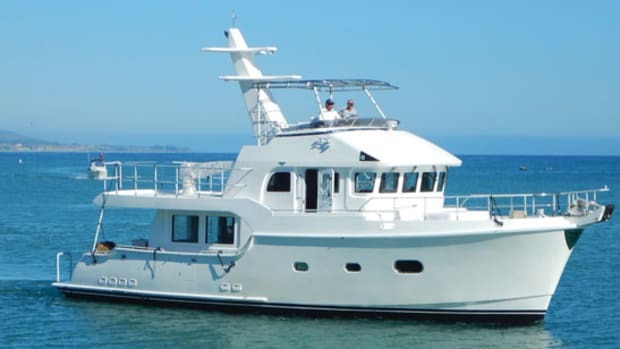 Still, it’s interesting to note that one of the first two 75 owners came out of a Nordhavn 57 and the other out of a very well-known brand of 53-foot convertible. Any boater would be impressed by the 75’s construction. But when he’s not enduring Force 8 conditions, he’ll probably be more appreciative of how quiet this boat is. Little wonder as sound control is built in. Two layers of Isodamp acoustical tiles are laminated into the hull in the way of the props. The engine room overhead, forward bulkhead, inboard fuel tank sides, and ventilation ducts all get a combination of two inches of Soundown lead-foam and two inches of 3M Thinsulate. For the two-inch saloon-galley sole, NidaCore is combined with a Soundown “decoupler” layer that snubs vibration. Every hatch (right) and door gets a full rubber gasket, and Thinsulate is employed in all interior bulkheads and overheads. Soundown Quiet Pro lines the engine room’s intake and exhaust ducting. Even the engine mounts are by Soundown.